January gloom brightened up considerably this year with an impromptu trip to Palm Springs! I love to visit Palm Springs during Modernism Week, but missed it this year, so was thrilled to cash in my JetBlue miles and jump on a direct flight to this sunny California haven. We still did a tour of the fab homes, but it was a lot less crowded. Styles to memorize: Butterfly Roof, Swiss Miss, Brise-Soleil, Pattern Block, Clerestory Window. Neighborhoods to browse: Little Beverly Hills, Twin Palms, Old Las Palmas, Movie Colony East, Tennis Club. Architects to know: Albert Frey, Richard Neutra, Donald Wexler, William Cody, A. Quincy Jones, Charles Tanner. Palm Springs is all about the appreciation of midcentury architecture and design. There are amazing tours of historic homes, parties, lectures and education about all things midcentury modern. The current owners have restored this beauty back to its original condition. Mr. Frank Sinatra would hang a flag between two palm trees on his property (on right) to let his Hollywood peeps know he was having a party. His “Twin Palms” estate set the standard for postwar Hollywood glamour and the ever-important cocktail hour. Dinah Shore and many of her LA friends lived close together with secret backyard entrances between their homes. Leonardo DiCaprio owns her home now. The historically significant Palm Springs Community Church, designed by Charles Tanner, was considered avant-garde at the time. It was destroyed in a September 2013 fire, but is slated for renovation and reuse in a collaboration between an LA design firm and the Palm Springs Architectural Advisory. This pink “House of Tomorrow” is a midcentury modernism icon. Elvis Presley leased the home in September 1966 for one year as a retreat from his activities in LA. He and Priscilla honeymooned here in May 1967 and had Lisa Marie nine months later. The Del Marcos Hotel was designed in 1947 by famed desert architect William Cody. The 17-room hotel is the perfect midcentury modern place to stay in Palm Springs! My trip was a lot of fun in the sun. DELICIOUS drinks with fresh squeezed oranges and grapefruits from Julie’s back yard. This time of year means you can go for a hike because the temperature is a perfect 50 degrees. We went on a great hike through the mountains one morning. You can see the snow on top of the mountains in January – so beautiful! My friend has a classic mid-century modern house and has done an amazing job in the four years since she bought it. Here is a quick outside view. Thanks to my Palm Springs hosts and all the fun things they organized! 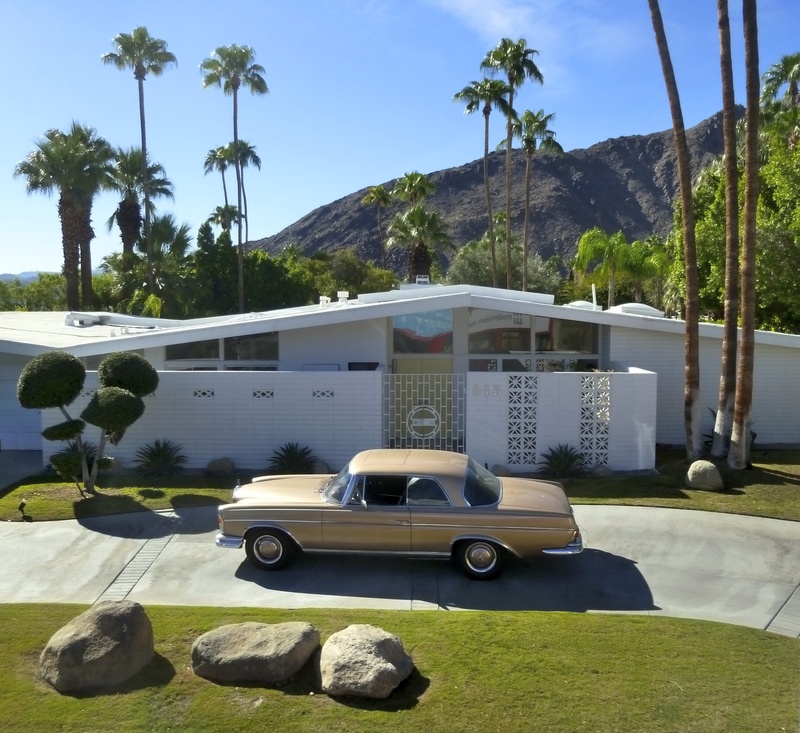 Fabulous piece about Palm Springs – and excellent photos! Thanks for this!! We have ever been and are finally going in early April to visit friends! Very excited!! We’re heading to the ferry to check on things. Hope all is well with you!! Mindy – I have restautant recommendations too!